First performed at the Fringe of Toronto Festival in 2010. This play took a while to take form in my mind. I was thinking about a particular scene - the first scene, it turns out - since about 2002. When the premise finally took shape and I knew there would be a good deal of farce involved, I enlisted the help of my friend, the Queen of Farce, Allison McWood. We co-wrote the play in 2009. My production company, Triple Take Productions, co-produced it with Good Egg Productions for the 2010 Fringe of Toronto Festival. Synopsis: (Comedy, with a healthy dose of farcical fantasy) Can a woman with a farcical curse find a normal, happy life without all the hijinx? 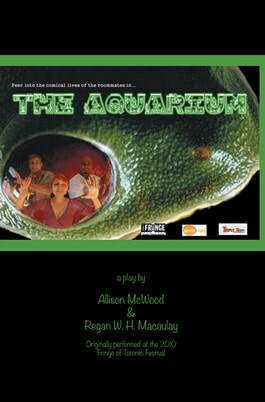 Only if she can get to the root of her curse during her stay in a flat affectionately known as "The Aquarium."